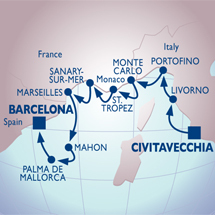 You know you’re sailing with Azamara when ten out of eleven nights on your voyage are late night or overnight stays! And a good thing, too, because every stop on this voyage will make you want to stay out late. In Florence the breathtaking art is indoors, while in Portofino it’s on display in one of the world’s most beautiful harbor and hillside settings. Soak up Cote d’Azur style in Monaco’s Grand Casino or along the yacht harbor in St. Tropez. Feast on the Spanish flavors of Menorca and sophisticated Palma de Mallorca before an overnight stay in the vibrant city of Barcelona.